There are a few vacant properties in Hawthorne and Jordan that I watch over, well, like a hawk. So much so that even when driving by, I can tell out of the corner of my eye that there is a new notice posted on the door. Most of the time, I can tell the difference between a water shut-off notice, a tax-forfeiture notice, condemnation, work permits, and other such "regulatory plumage" even at a distance. I've impressed friends and colleagues by knowing the difference not only by the color of the notification, but even the tape used to affix, or the format and typesetting that is visible at a distance. In many ways, this is public discourse and public service at its finest. Several weeks ago, I and other northside housing activists noticed that quite a few tax-forfeited properties were winding up in the hands of slumlords. The more we looked at the issue, the more we realized that the system was essentially set up to enable those property owners and shut out good ones. It only took one blog post (and some discussion on North Talk) before County Commissioner Linda Higgins and Minneapolis Council President Barb Johnson responded and set up a meeting. I used a second post to lay out some potential solutions prior to that discussion. Higgins and Johnson came prepared, however. At that meeting they and city and county employees laid out a series of proposals for how to limit such problematic acquisitions. I believe we all left that meeting energized about changing our community for the better. At least as a citizen, I am tremendously excited when there is swift constituent response, especially when that response comes with solid proposals that our elected officials come up with. Post and top two screen images by the Hawthorne Hawkman, bottom photo originally appeared on Johnny Northside. 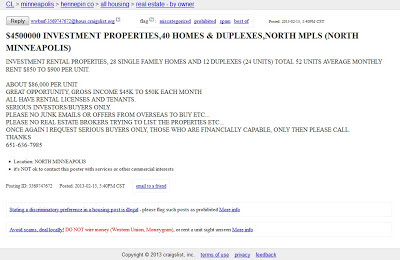 Notorious slumlord Mahmood Khan has posted a Craigslist ad selling what is believed to be many, if not all, of his north Minneapolis properties for one lump sum...of $4.5 million. The biggest worry that such a move causes is that at a price that seems drastically over-inflated, the next buyer will be another slumlord who is as bad or worse than Khan - assuming of course that the offer to sell is even remotely genuine. But if there is a chance to either chip away at his inventory or arrange a buyout in the same manner as the Spiros Zorbalas sale, it would seem that now is the time. Still, who seriously expects to make $4.5 million off of a Craigslist ad? Furthermore, the sale becomes difficult to finance even for bona fide buyers on the up-and-up, since the individual market value of these structures is almost certainly nowhere near a cumulative four and a half million. The only way that amount is remotely feasible is if one goes off of an income-based approach and puts very little into upgrading the existing structures. Khan would need to be talked down significantly from this price point, if for no other reason than the end use of many of these houses should be conversion back to owner-occupancy. The new owner(s), if they are good ones instead of the next round of slumlords, would have to put serious money towards repairs, and the proceeds to make the purchases viable would have to come from resale and not continued rental use. Rally the troops! Public, private, and non-profit! This may be a tremendous opportunity to turn around the neighborhood in one swoop. Last summer I was asked, as a Jordan resident, what I thought about a house at 2637 Emerson Avenue North. 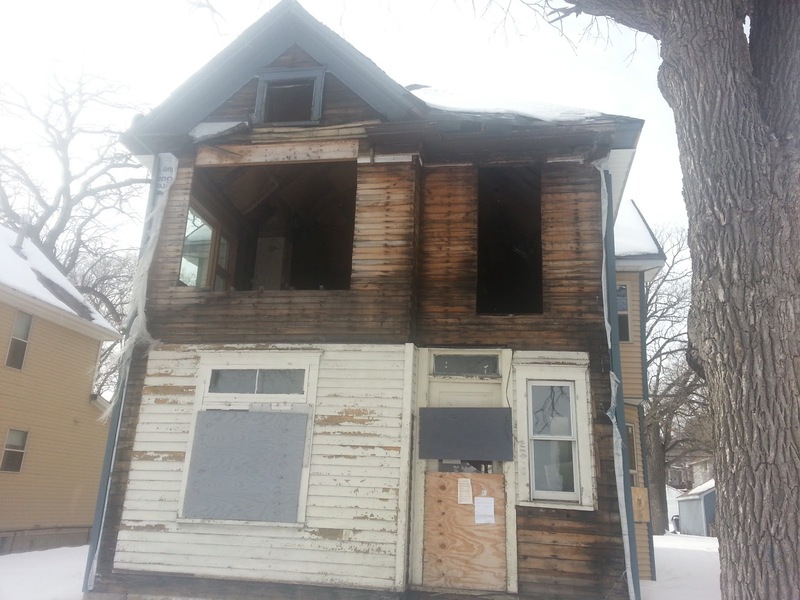 It was a vacant property on the MLS for a song, and the City of Minneapolis was contemplating acquisition for demolition. I maintained that the built form of the house was intact, that the interior wasn't beyond repair, and that the block already had four vacant lots and would not be improved with a fifth. My position as a resident was that this house should be purchased to keep it out of the hands of a slumlord, but that it should not be demolished. I was not entirely surprised to see that CPED moved forward with acquisition and began the demolition process in spite of my recommendations. 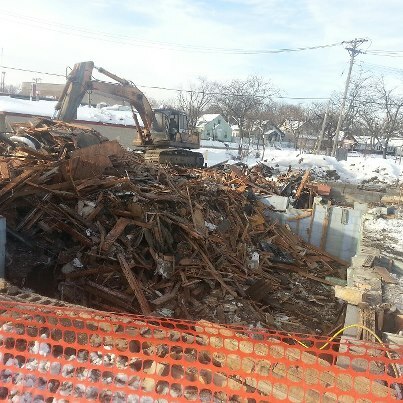 It wouldn't be the first time, and nicer houses have been torn down. I was pleasantly intrigued though, when Nicole Curtis the Rehab Addict, made a public push to make the backhoe go away. That move has revealed a few problems with the demolition process, not the least of which is the demolitions themselves. But the process overall is wrought with inconsistencies that don't serve anyone well. Stopping a demolition at the last possible moment is stressful on any preservationist. Having to undo the demo contract can't be pleasant for city staffers. And losing out on a contracted demolition is fundamentally unfair to the crew that just showed up to do a job. But as more and more good private market developers are coming out of the woodwork in north Minneapolis, they are proving one of my long-held beliefs: there is a market for these homes, if they are marketed correctly. 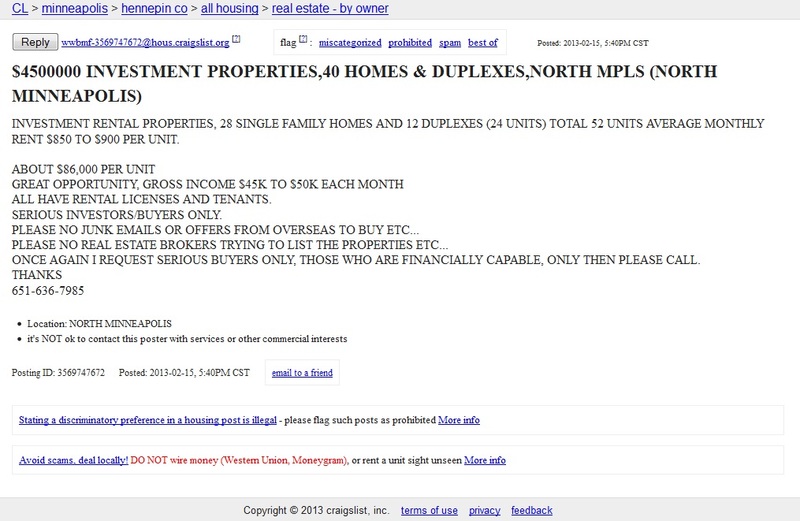 Every year on the City of Minneapolis website, a list of tax-delinquent property owners gets published. The list can be a bellwether for up-and-coming slumlords, or can be a way to find out which properties are owned by known bad actors (since the city's website doesn't allow for the public to search by owner name). The 2012 list isn't out yet, but 2011 shows a common pattern many on the northside hadn't noticed before. There is frequently a different "billpayer" than the taxpayer/property owner. Why would this be? Friends and neighbors, some of whom are more knowledgeable in housing intricacies than I am, haven't been able to figure this out.